Genetic Technologies has stepped into a more colorful and vivid realm of genetic analysis. June of 2015, Genetic Technologies, Inc. added a new Multi-Capillary Genetic Analyzer to its already formidable arsenal of advanced Capillary Electrophoresis equipment. Not only will this new analyzer increase throughput capabilities, it will also offer the ability to leverage the latest amplification chemistries. 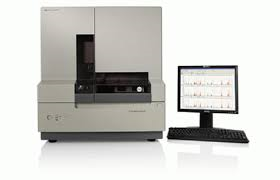 The new Multi-Capillary Genetic Analyzer builds on the advantages of Capillary Electrophoresis technologies while enhancing the ability to “see” and map genetic information with state of the art chemistries, improved optics and upgraded software applications. The analyzer is engineered to detect additional fluorescent dye labels simultaneously, an advancement from legacy versions which can see only five. Adding a new dye capability allows the analyzer heightened sensitivity in detecting DNA fragments that are similar in size. Advanced optics allow clearer “sight,” providing extremely high resolution, and are coupled with the utilization of multiple capillary arrays to greatly increase throughput capacity and quality. Kent Harman of GTI explains, “More is not always better, but in this latest acquisition, we have improved sensitivity and greatly expanded the number of loci that are simultaneously co-electrophoresed.” The analyzer broadens the spectrum of genetic markers that can be mapped by almost double, providing a more information-rich view of crime scene DNA evidence. The Multi-Capillary Genetic Analyzer is built to provide the highest quality data for a wide range of sample types, even in the most challenging of scenarios where minimal amounts of DNA are available. It also means more accurate and rapid analysis for time-sensitive, DNA based forensic biology and human identification scenarios. The new equipment and chemistries are expected to be fully validated and ready for implementation by the third quarter this year.